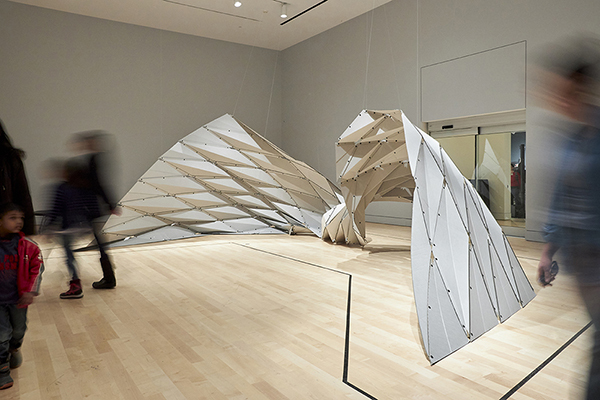 Correspondences planned and otherwise swirl around the Art Gallery of Hamilton’s Above the Fold, a touring exhibition of contemporary origami that delights and disappoints in uneven measures. Vincent Floderer’s unearthly paper creatures suspended from the ceiling are a telling example: beautifully aquatic beings that evade full appreciation, being either obscured in shadow or blown out of sight by track lighting that blinds the eye that dares to gaze upward in the wrong direction. Yuko Nishimura’s exquisitely delicate friezes of small geometric forms make for easier viewing, coalescing into large abstractions that vibrate with motion and light. Her virtuosity overwhelms and soothes in the same breath, while setting a standard near-impossible to match. Robert Lang’s Pentasia of modular rooftops and Jiangmei Wu’s Ruga Swan – a fallen angel of slumped wonder vast enough to offer shelter – are visually stunning at a glance, but lack Nishimura’s caring hand for materials, with strained folds and peeling edges equally apparent. The Living Room: unfolding… offers an interactive accompaniment to Above the Fold, anchored by the work of Kristiina Lahde. I dutifully folded Sonobe forms in the muted black, white, and grey origami paper provided; yet as my fingers worked, I remained transfixed by the stubborn flatness of Lahde’s Ten Fold. The ink of her prints sinks luxuriously into the toothy paper, reducing her variations on bent and folded paper to soft velvet surfaces. Her Envelope Piece series return to objecthood with an arresting contrast of roughly torn envelopes whose exposed security linings have been perforated with surgical patterns, but these too are a significant departure from the techniques advanced in Above the Fold. This dissonance is thrown into sharper relief upon entering Hamilton Now: Object, the second of two incisive exhibitions curated by Melissa Bennett to encapsulate this complicated present moment in Hamilton art. Laura Marotta’s modular cardboard constructions are shockingly resonant with Above the Fold, folded and fitted with a meticulous touch that outshines most of the international artists included there. Her shelf of Studio Models includes examples of that same Sonobe folding technique I had just learned, in vibrant Mylar colours far more appealing for play. Whether by coincidence or some deeper design, Marotta’s sculptures provide the answer I was seeking in The Living Room – craft deftly balanced in architecturally compelling form, all found far closer to home. Above the Fold continues until May 26. The Living Room: unfolding… continues until May 12. Hamilton Now: Object continues until May 20. Stephanie Vegh is an artist and writer who has exhibited her work in the UK and Canada, and publishes art writing and criticism both locally and nationally. She maintains an active profile in regional arts advocacy, and currently serves as Manager, Media and Communications at the Kitchener-Waterloo Art Gallery. She can be followed on Instagram @stephanievegh.